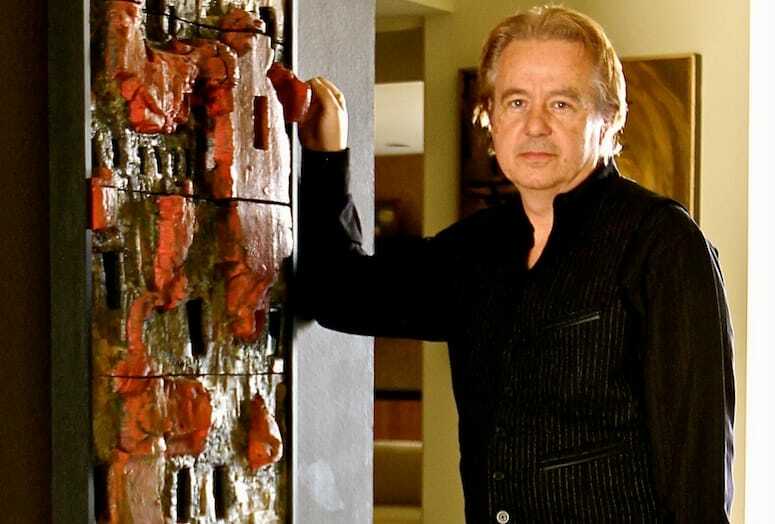 Mark Davis, former owner of the Kenaston House in Rancho Mirage, stands alongside a Stan Bitters wall sculpture, commissioned especially for the Kenaston House in Rancho Mirage. VIDEO: Hear from Mark Davis about the Kensaton Home in Rancho Mirage and how it led to opening his own business. So you bought yourself a piece of architectural history. Now what? Not sure how to proceed with the remodel? Mark Davis of Modern Home Design Showroom in Palm Springs knows firsthand what it’s like to remodel an iconic piece of architectural history. In 2000, he purchased the Kenaston Home in Rancho Mirage by midcentury modern Architect, E. Stewart Williams. He wanted to maintain the integrity of the home, while incorporating key modern finishes that would help enhance the home’s classic appearance. But it proved challenging to find local companies that could provide the proper finishing products in restoring a historic home. The challenge became a source of inspiration for Davis, who in 2003 opened Modern Home Design Showroom — the first outlet for midcentury and contemporary modern home restoration in the Coachella Valley. Modern Home has recently moved to the Sun Center Shopping Mall in South Palm Springs with a new showroom stocked with a fresh selection of modern tile, carpet, art, and other modern home decor products. “It’s even more of a candy story of modern delight," Davis says. The Kenaston Home in Rancho Mirage was built by renowned architect E. Stewart Williams in 1957 for the Kenaston family. This midcentury modern home is historically designated by the City of Rancho Mirage. Privately owned and occasionally rented out for professional photo shoots and filming. Simple textured rock wall along the pool area, and adjoining eastern facing living room wall add a warm organic element to the design aesthetics of the home. A signature design feature of an E. Stewart Williams home. The corrugated wall is a dominate design feature throughout the Kenaston home, extending along the interior of the living room wall, to the exterior poolside, and again along the west facing exterior wall of the home. The corrugated aluminum wall had been painted several times over the years. Removing the paint without scratching the wall proved to be the most challenging aspect of restoring the homes. The Kenaston Home is tastefully decorated with midcentury modern furniture and art, like this specially designed Shell chair by Hans Wagner. Along with this vintage painting by French artist Bouvier de Chachard (1929-2013), who was the same artist that painted the vintage art piece in the Modern Home Showroom once owned by Frank Sinatra. The current owners of the Kenaston home spared no expense in decorating the home with Mid-Century Modern Furniture. The sofa’s are designed by Edward Wormely for Dunbar, they are both quite rare designs. After 12 years at the north end of Palm Springs, Mark Davis' Modern Home has moved to their new location in the Sun Center Shopping Mall in South Palm Springs. Modern Home’s new showroom of 6000 square feet has an even greater selection of modern furnishing products from tile, carpets, decorative hardware, to vintage modern art. This 1965 photo, known as The Power Lunch, shows Frank Sinatra seated with Warner Brothers executives in his office. Notice the painting along the wall – A Bouvier de Cachard (1929-2013) St. George. Venice Italy Oil on Canvas Painting 1962, formerly owned by Sinatra, now part of the Modern Home Vintage Art Collection, sell price, $14,500. Some of the unique finds you’ll discover at Modern Home Showroom, is this vintage 1950’s-60’s East German Lava Vase. This “Lava” style was very big in East German pottery during the Mid-Century Modern era. Other works of vintage art found at Modern Home include this Charles Levier, 1960 Oil on Canvas painting, formerly owned by Elvis Presley and hung in his Beverly Hills home. Sell price, $14,500.